Nothing wrong with going back to basics from time to time. My Basic Knit Cup Cozy is a one piece cozy that slides onto a cup with ease. That means no fiddling with buttons while you’re trying not to spill your drink in the car. It fits a standard take-out cup for your coffee, tea or hot chocolate. This cup cozy features a smooth stockinette center bordered by ribbing on the top and bottom. It is knit as a flat panel with a few increases then seamed to create a tapered sleeve that gives a secure fit. 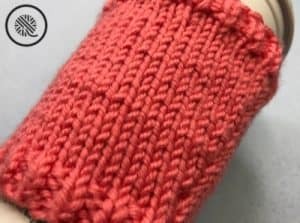 This basic pattern includes a video tutorial for both right and left handed knitters so you can see exactly how to work the pattern from your own unique perspective. 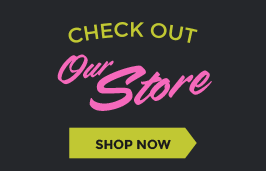 Be sure to scroll to the bottom of the page to see the videos. I know what you’re thinking… it looks so plain! But basic and plain are not the same thing. Being simple has its advantages. I intentionally designed this pattern to be a blank canvas for your creativity. With a basic knit cup cozy you can make a bold color statement or add stripes by changing yarn color. My favorite way to easily personalize one of these it with the duplicate stitch. With the duplicate stitch you can add your monogram or a picture design to personalize each cup cozy. And it’s so much easier than trying to knit the design into the cup cozy while juggling different balls of yarn. I’ve got a great resource to show you how to work the duplicate stitch, plus free charts to get you started. 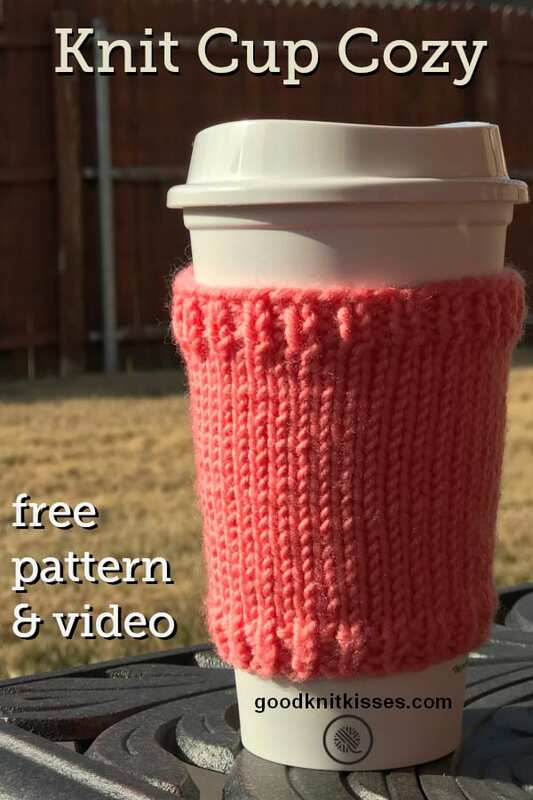 PIN the Basic Knit Cup Cozy Pattern! A PDF download of this pattern is available in my Ravelry store. 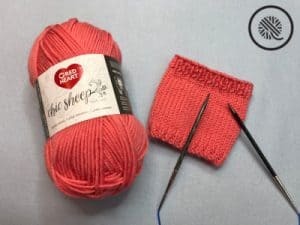 Red Heart Chic Sheep (100g / 3.5oz, 170 m / 186 yards) any color; sample – Mimosa. Kfb = Increase 1 stitch by knitting into front and back of next stitch; leaves a visible purl looking bump. M1 = Increase 1 stitch; lift bar between previous stitch and next stitch, place on needle and knit into back of stitch to increase. Gauge is important to this pattern as your cozy will be fitted to a tapered cup. That means the cup is wider at the top than the bottom. The pattern starts the bottom of the cozy at 7.75” [20 cm] and works up to approx 9.5” [24 cm] wide. 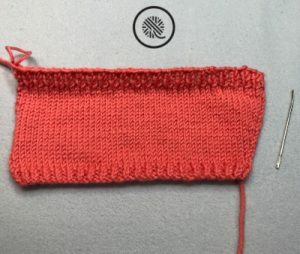 If you substitute a different yarn you will need to check your gauge and adjust your cast on stitches accordingly. 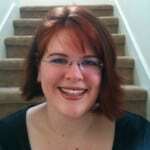 My online Interactive Knitting Calculator can help you do the math. The cozy is approx 4” [10 cm] tall so that you have a wide space to add special elements like stripes or a duplicate stitch design. If shorter cozy is desired, simply stop at your desired height and work the last 3 rows of the pattern. 7th row: K1. INC. Knit to end of row. 8th to 19th rows: Rep last 4 rows 3 more times. (47 sts at end of repeats). 22nd to 25th rows: Rep last 2 rows 2 more times. Measures approx 3.5” [9cm]. 26th row: (WS) P1. *K1, P1. Rep from * to end of row. 27th row: K1. *P1. K1. Rep from * to end of row. 28th row: As 26th row. Cast off in pattern leaving a 12-16” [30-40 cm] tail for sewing.